Pick a plan architect (us, of course). 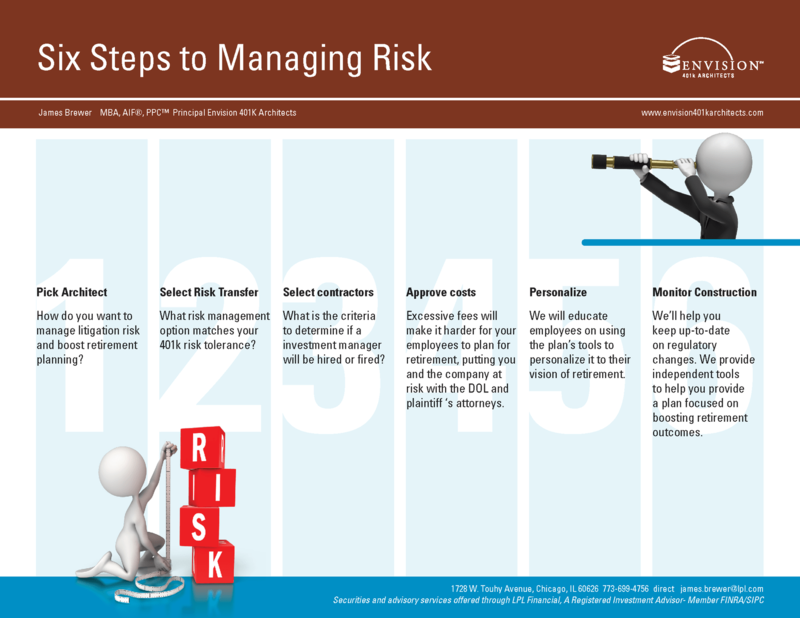 How do you want to manage litigation risk and boost retirement independence? Choose your level of fiduciary outsourcing. What risk management option matches your 401k risk tolerance? Choose your providers. What’s your criteria to determine if a provider will will be hired or fired? Choose individualized retirement planning services to help your employees pursue their idea of retirement success. Monitor your plan’s fees to see that your employee’s are getting their monies worth. Excessive fees will make it harder for your employees to plan for retirement, putting you and the company at risk with the DOL and plaintiff‘s attorneys. Have us help you monitor your providers. We’ll help you keep up-to-date on regulatory changes. We provide independent tools to help you providea plan focused on boosting retirement outcomes. Today, are you working with a broker or an investment advisor? Brokers take on no fiduciary liability under ERISA. You know you have a broker if your employees pay commission. Instead, a 3(21) investment advisor shares in your fiduciary responsibility. An independent fiduciary (ERISA 402a) essentially runs your plan. This gives you greatest delegation of risk and time savings. A discretionary trustee provides similar fiduciary services but does not oversee the advisor. An ERISA 3 (38) investment manager takes on full discretion of your investment menu. An ERISA 3 (16) takes on the liability of the administrative functions, such as required notices and calculating required minimum distributions. Do you use an independent source to benchmark your investments or do you use your provider’s proprietary report? Do you use independent tools to show the fees you approve on behalf of your employees are fair and reasonable? Do you have a system to make sure that all required processes and documents are ready should you be investigated or sued? To help employees retire, we offer these options retirement advice, a financial wellness program and help for new hires and terminating employees. Envision 401k Advisors, acting as a plan architect focuses on serving the distinct needs of the employer and employee. We help you implement fiduciary structures to tackle your investment, provider and administrative monitoring duties. We also provide advice, education and transition services to help your employees. Imagine, that 70% of your employees can replace 70% of their income through retirement? What would that do for company productivity, healthcare costs and their well-being? Imagine the confidence you’ll have knowing that your providers are actually sharing in or taking on the liability you have. Contact us, to learn more.